In my (never ending) quest to inundate my life with all things Android I run across some of the most bizarre and sometimes awesome things. Fortunately, my family tolerates my craving for more (usually, until I brought my Nexus One to bed with me… ya that was some great advice). I did find something recently that I had to fight my kids over though, and even standing at 6’4″ tall and 240 lbs, I almost lost it to them. I love this little dude. 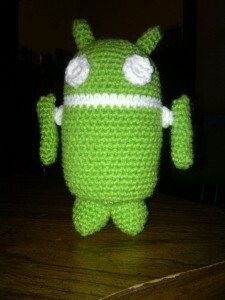 Handcrafted by a lovely young lady named Nicole Aaron at A Plus Amigurumi, he’s just too adorable. Yes, a 33 year old grown man just said “adorable.” You can find Nicole Aaron and her awesome creations, including the stuffed Android (it’s NOT a doll!) at her Etsy Store. Price is only $15 and $4.95 to cover shipping anywhere in the United States. If you live outside of the States, Nicole Aaron will ship it to you for only $7. Since she makes every single one of these by hand, it does take a while to get to you (mine arrived three weeks after I placed the order). 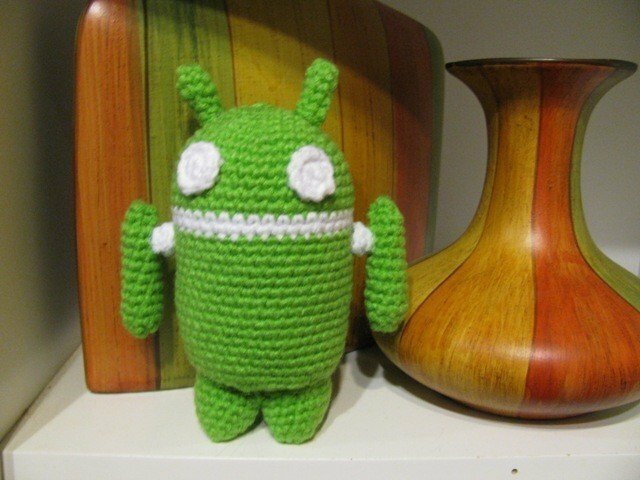 But, it’s well worth the wait to be the envy of your other Android-loving friends. Even if you are a 33 year old man that still plays with dolls collects memorabilia.